Indeed, a useful thing, this towel, then, eh? This was first celebrated in 2001, two weeks after the death of Adams, as a way for his fans to remember him, celebrate him, and in this uniquely weird way, honour him. Adams was only 49 years old when he died of a sudden (and unexpected) heart attack. His fans found a uniquely weird way to keep his memory alive. The first couple of years, the event was a small one that was celebrated within a close clique of Adams aficionados, but over the years, it has spread and become a real phenomenon globally. Here I am, sitting in India, wiping the sweat off my brow with a moist towel, writing about Towel Day. That should tell you a lot about the global dissemination of the Adams phenomenon! 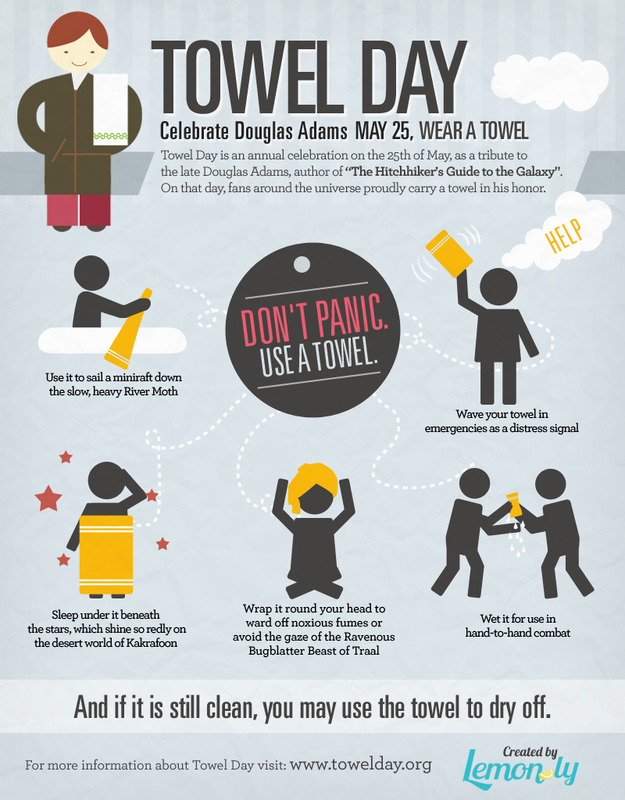 Tags: Douglas Adams, Geeking out, h2g2, Hitchhiker, Hitchhiker's Guide to the Galaxy, Towel Day, World Towel Day. Bookmark the permalink. Previous post ← Meet Your Match: USMLE Match 2014 Interview #3: Meet the Little Rock-Star!